Zurich's Cabaret Voltaire began the 20th century of inventive nightlife and New York's JACKIE 60 finished it with a spectacular finale three days before the century's end. JACKIE 60 was begun in 1990 by local night life luminaries CHI CHI VALENTI and JOHNNY DYNELL, choreographer RICHARD MOVE and fashion designer KITTY BOOTS. The four set out to create a club environment that was performance oriented and distinctly underground in tone. They developed the Jackie 60 formula, with its weekly themes and live, stream-of-consciousness MCs. After closing JACKIE 60 in 1999, founding JACKIE FACTORY producers CHI CHI VALENTI and JOHNNY DYNELL continue to shape new nightclub hybrids and spectacles in NYC and worldwide. Stay tuned to their latest doings on their JACKIE FACTORY SITE, FACTORY FACEBOOK, and message boards THE MOTHERBOARDS NYC. And listen to THE JACKIE HUSTLE on YOUTUBE, here..
JACKIE 60: THE MOVIE, directed by JACK GULICK, is a story of nightclub life, invention, and mischief in downtown New York City. This documentary (still unfinished) reveals the intense underground club scene at the end of a decade and chronicles the final forty weeks of JACKIE 60 in 1999. Read more HERE or watch the trailer at right. Above - JACKIE 60 "Cokewhore" invitation circa 1992, for a play co-written by MICHAEL MUSTO, SCOTT FRITZ and Valenti for the JACKIE 60 PLAYHOUSE. 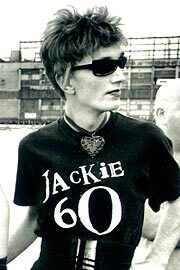 Above Right- HATTIE HATHAWAY wears the classic JACKIE T at WIGSTOCK 1999. - as well as several color choices.